We know: You don’t want bulging biceps or thunderous thighs. But that doesn’t mean you should skip the weight room. Lifting weights has some surprising perks that you can’t get from cardio alone. Research shows that just two strength-training sessions a week can help you burn more fat, sculpt lean muscles, feel more energized, and so much more. Here are eight reasons you should start lifting today. Before starting this or any new exercise regimen, though, make sure you consult your doctor. Research shows that resistance training can help beat the blues. Although cardio burns more calories than strength training during your 30-minute sweat session, lifting weights burns more overall. It all goes back to building muscle. It takes more energy (calories) for your body to maintain muscle cells than it does fat cells. So by lifting weights to add more muscle mass, you’ll boost your metabolism and turn your body into a more efficient fat-burning machine. Research shows that between the ages of 30 and 70, women lose an average of 22 percent of their total muscle. What’s even more upsetting is that over time, the muscle void is often filled with fat. One pound of fat takes up 18 percent more space than one pound of muscle, so even if the number on the scale goes down, your pants size might go up. The best way to stay tightly packed? Keep strength training! For best results, Tom Holland, MS, CSCS, author of Beat the Gym, recommends two to three total-body strength workouts per week for 30 minutes each session. Include three to four days of cardiovascular exercise, either on the same days or alternate days. 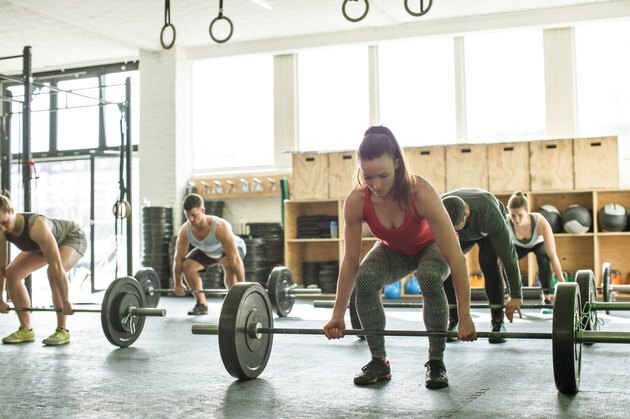 Lifting weights can be your best defense against osteoporosis — a disease affecting 10 million Americans, 80 percent of which are women, according to the National Osteoporosis Foundation. "When you lift weights, you engage muscles that pull on the tendons which, in turn, pull on the bones," says Holland. "This added stress makes bones stronger." 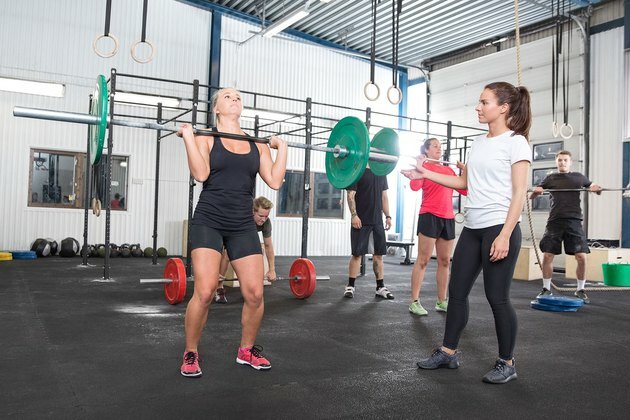 It may seem counterintuitive that weight lifting can help lower blood pressure, since blood pressure actually goes up during and immediately after your strength session. But research shows it can be a powerful way to protect your ticker in the long run. “As muscles contract, blood is pushed back up to the heart,” says Irv Rubenstein, PhD, exercise physiologist and founder of S.T.E.P.S., a fitness facility in Nashville, TN. "The heart then recirculates this oxygenated blood back to the muscles, which keeps the cardiovascular system in better working order." Plus, maintaining lean muscle mass enables you to do more work overall, further enhancing this effect, Rubenstein says. Muscles strengthen both your body and your brain. According to a new study published in the May 2012 issue of Mayo Clinic Proceedings, a combination of mentally stimulating activities like using a computer and exercise (which included walking and other cardio as well as strength training and sports activities) helped protect brain functioning in older adults. The combination of computer use with moderate exercise can decrease the risk of memory loss more than either one activity on its own. Move over, runner’s high! Weight training also has the power to induce pleasure by releasing endorphins, the “feel-good” chemical in your brain. Research shows that resistance training can help beat the blues. One Australian study found that people who did three strength workouts a week (chest presses, lat pull-downs, and biceps curls) reported an 18 percent drop in depression after 10 weeks. In addition, exercise reduces levels of the stress hormone cortisol, potentially relieving feelings of anxiety and agitation. Lifting weights helps improve the way your body processes sugar, which can help prevent diabetes. And if you already have diabetes, research shows that extended periods of strength training improve blood sugar control as well as taking a diabetes drug. In fact, the combination of strength training and aerobic exercise may be even more beneficial than drugs. Ever try to put on one sock while standing on the other leg? Without strength training, this simple act can feel more like a circus trick over time. The reason: fast-twitch muscle fibers we use for strength training deteriorate with age. (Aerobic exercises use mostly slow-twitch fibers.) "The fast-twitch fibers assist in speed and power movements and contract quickly and with sufficient force to catch yourself when you lose your balance,” Rubenstein says. “Resistance training maintains the ability of these fibers to activate." How Many Times a Week Should I Go to the Gym to Lose Weight?